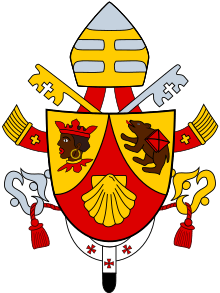 Introduction to Christianity (German: Einführung in das Christentum) is a 1968 book written by Joseph Ratzinger (Pope Emeritus Benedict XVI). Considered one of his most important and widely read books, it presents a "narrative Christology" that demonstrates the place for faith is in the Church. The book offers a "remarkable elucidation of the Apostle's Creed" and gives an "excellent, modern interpretation of the foundations of Christianity". Originally published in German in 1968 under the title, Einführung in das Christentum, Ratzinger restates the Apostles' Creed and the meaning of this foundational text in language that has a greater contemporary resonance than the Creed itself. [N 1] Like the Apostles' Creed, the book presents the doctrines pertaining to the Father, the Son, and the Spirit in sequence. Introduction, "I Believe – Amen"
which provides an argument for God's existence based upon the intelligibility of being qua thought ("thought-being") and for freedom as the "structural form of all being"
I. "I Believe in Jesus Christ, His Only Son, Our Lord"
He ascended into heaven and is seated at the right hand of the Father Almighty. 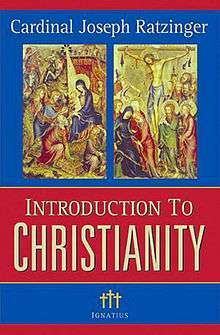 The English edition of Introduction to Christianity was revised in 2000 by Ignatius Press with a new preface by Joseph Ratzinger. A second revised edition was released in 2004 by Ignatius Press. ↑ The Apostles' Creed was based on Christian theological understanding of the Canonical gospels, the letters of the New Testament, and to a lesser extent the Old Testament. Its basis appears to be the old Roman Creed. 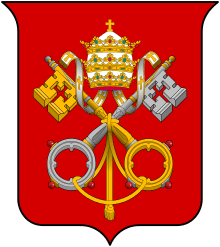 The name of the Creed may come from the fifth-century tradition that, under the inspiration of the Holy Spirit after Pentecost, each of the Twelve Apostles dictated part of it. It is traditionally divided into twelve articles. Saint Ambrose referred to the "Creed of the Apostles" in AD 390. ↑ "Introduction to Christianity". Ignatius Press. Retrieved February 23, 2012. ↑ Burrell, Craig. "Introduction to Christianity". Book Notes. Retrieved February 23, 2012. 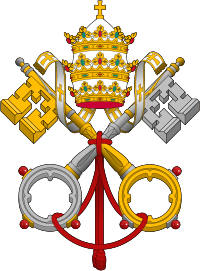 ↑ "Catechism of the Catholic Church". Vatican. Retrieved February 23, 2012.